Topical search aids, like The New Topical Textbook, are great ways of getting a topic and researching it in Scripture. 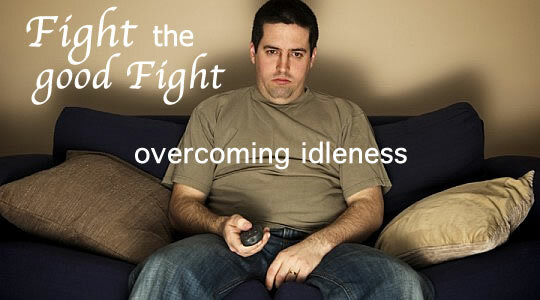 Since we can all get feeling a bit lazy and unmotivated, the topic of “Idleness” is a good subject to look into to see what the Bible has to say about it. In context, it will help us to see how to overcome it. One of the ways of overcoming idleness is to get into the ring and fight, spiritually speaking, of course. Those of us in Messiah understand that we’re fighting a spiritual fight, not a physical one. Keeping that in mind, we can turn to Yahweh’s Spirit and His Word for help. In an area describing gifts from the Spirit, we're told not to fall behind in doing things which are right and true, in Yahweh’s sight and Spirit. Love must be sincere. Hate what is evil; cling to what is good. Be devoted to one another in love. Honor one another above yourselves. Never be lacking in zeal, but keep your spiritual fervor, serving the Master. Be joyful in hope, patient in affliction, faithful in prayer, Romans 12:9–12 NIV. But the fruit of the Spirit is love, joy, peace, longsuffering,gentleness, goodness, faith, meekness, temperance: against such there is no law, Gal. 5:22-23. Even though a number of things are listed in these verses along with love, they all stem from the singular fruit of the Spirit, which is love. And, of course, we understand that Yahweh can be defined by the one word, Love (1 John 4:8). His Spirit accomplishes His will, in love. It’s easy to get overwhelmed today with everything under the sun to do, but what is really important is to be able to build up the Body of Messiah in truth and to help it grow in stature to the maturity of the Messiah by conforming to Him. The ultimate maturity is to be able to give our lives to one another as He gave His life for us. Since those in Messiah are few in number, it’s important for us to come together for the sojourning Feasts, as we’re enabled to do so. For those not able to come, it’s going to be good to call or write them. This is one way to overcome idleness by spending time helping others. It’s also good for us to do so. Are you feeling idle and slothful? Volunteer your time to help the brethren, sign up for activities at the Feast of Tabernacles. Save a second tithe so you can come to the Feasts and serve before Yahweh at His appointed times. Can’t come? Then send your greetings. Send something to be read to the entire congregation. Let them know they also have a brother or sister who is with them in the Spirit of Yahweh. And, vise vers, we can send our greetings and love to those unable to make it, to whom we know are dedicated and if it had been possible, they would have been there where Yahweh has placed His Name. For Elohim is not unrighteous to forget your work and labour of love which you have shown toward His Name, in that you have attended to the set-apart ones, and still attend. And we desire that each one of you show the same eagerness, to the entire confirmation of expectation until the end, in order that you do not become sluggish, but imitate those who through belief and patience inherit the promises, Hebrews 6:10–12 TS. We’ve only touched upon a few Scriptures, but don’t we already feel motivated to act? If we don’t act, are we not going to suffer loss? "Cause and effect" is what we’re talking about. We reap what we sow. If we’re not building up and doing Yahweh’s work, then we’re essentially tearing down and doing the devil’s work. What is the end of it? It’s not good for the sluggard, that’s for sure. We have to get up and fight and work at doing what we need to do, otherwise we will be overcome by the world (rather than overcoming it). I passed by the field of the sluggard and by the vineyard of the man lacking sense, and behold, it was completely overgrown with thistles; its surface was covered with nettles, and its stone wall was broken down. When I saw, I reflected upon it; I looked, and received instruction. “A little sleep, a little slumber, A little folding of the hands to rest,” then your poverty will come as a robber and your want like an armed man, Proverbs 24:30–34 NASB. This was written by a man who was given wisdom, but the One Who is Wisdom takes this a step further in the parable of the talents, or coins as they are referred to in the New Century Version. The king said to the men who were standing by, “Take the coin away from this servant and give it to the servant who earned ten coins.” They said, “But sir, that servant already has ten coins.” The king said, “Those who have will be given more, but those who do not have anything will have everything taken away from them. Now where are my enemies who didn’t want me to be king? Bring them here and kill them before me,” Luke 19:24–27 NCV. This is a pretty graphic story. It brings home the point that we had better use what we’ve been given and not hide it away nor bury it somewhere where it can’t be found. It also appears that this parable deals with those who decided that they didn’t want to serve the King at all, but evidently did have the opportunity to do so. In view of all this, make every effort to respond to Yahweh’s promises. Supplement your faith with a generous provision of moral excellence, and moral excellence with knowledge, and knowledge with self-control, and self-control with patient endurance, and patient endurance with righteousness, and righteousness with brotherly affection, and brotherly affection with love for everyone, 2 Peter 1:5–7 NLT. When we come into the faith, are we growing? Are we making some mistakes along the way? Yes and Yes. The fact is, we are battling everything from fatigue to other flesh oriented things, because we are still in the flesh. But, we are to master those things which would be against Yahweh. And we are to focus on Him and rely on His Spirit to get us through. Therefore do not let sin reign in your mortal body, to obey it in its desires, neither present your members as instruments of unrighteousness to sin, but present yourselves to Elohim as being alive from the dead, and your members as instruments of righteousness to Elohim. For sin shall not rule over you, for you are not under the law (i.e., under the penalty thereof) but under favour…For the wages of sin is death, but the favourable gift of Elohim is everlasting life in our Master Yahshua Messiah, Romans 6:12–14, 23 TS. Serve only Yahweh your Elohim and fear Him alone. Obey His commands, listen to His voice, and cling to Him, Deuteronomy 13:4 NLT. (See also Eccl. 12:13). This is a little different from what you hear today, but this is the constitution of the coming Kingdom and it is for us now. It’s what went on the side of the Ark of the Covenant into the Promised Land. And, it’s not just for the physical people, but even the angels are to obey Yahweh. Yahweh hath prepared His throne in the heavens; and His kingdom ruleth over all. Bless Yahweh, ye His angels, that excel in strength, that do His commandments, hearkening unto the voice of His word, Psalm 103:19–20 KJV. How are the angels strengthened? Are they not strengthened by Yahweh? So where do we get our strength? It’s the same source of Power that was and is in Messiah. Finally, my brethren, be strong in the Master and in the power of His might. Put on the whole armor of Yahweh, that you may be able to stand against the wiles of the devil. For we do not wrestle against flesh and blood, but against principalities, against powers, against the rulers of the darkness of this age, against spiritual hosts of wickedness in the heavenly places. Therefore take up the whole armor of Yahweh, that you may be able to withstand in the evil day, and having done all, to stand. Sort of sounds like a fight for our life, doesn’t it? That’s exactly what it is. We are enabled with the tools given us to overcome, but we have to gather them up and use them. They are available to us, but we must choose to pick up the pace and to move forward in this fight we are in. Doing so will assure that we do not become idle. Stand firm then, with the belt of truth buckled around your waist, with the breastplate of righteousness in place, Ephesians 6:14 NIV. And with your feet fitted with the readiness that comes from the evangel of peace. What is the evangel of peace? What is the good news? Isn’t it made up mostly of the fact that Yahweh sent His only begotten Son to live with man, so that we might have an appropriate sacrifice to forgive us of our sins? Knowing that breaking the law produces the death penalty, we need to have faith in the One Who can save us. And what is it that the saints have in common, as is mentioned in Revelation 14:12? They keep the commandments of Yahweh and keep the faith of Yahshua. “The truth and the evangel of peace” or Yahweh’s written commands and the forgiveness of transgressions against those commandments through Yahshua’s sacrifice, having faith that we are indeed forgiven and don’t have the death penalty hanging over us. Does this mean we will never sin? No, but we have an advocate on High to appeal through for mercy and ultimately forgiveness. So don’t give up, but rather stop sinning. If we confess our sins, He is faithful and just to forgive us our sins, and to cleanse us from all unrighteousness. If we say that we have not sinned, we make Him a liar, and His word is not in us, 1 John 1:9–10 KJV. My little children, I am writing these things to you so that you may not sin. And if anyone sins, we have an Advocate with the Father, Yahshua Messiah the Righteous, 1 John 2:1 NASB. So what he is basically saying, is, "Don't sin." But, if you have, you still have an advocate to plead your case. Ultimately, John does not powder cake the importance of not sinning, as he continues with wording that makes it clear that if one continues sinning, they essentially have never known Yahweh nor Yahshua, and are, in fact, a liar. Why would he say that? Because these are brethren who claim to know Yahweh and His Son, but if they don’t live according to Scripture and in the Spirit of Yahweh, then they are lying to themselves and everyone around them! The Apostle Paul said similar things to the brethren to get them to wake up and repent, which is what they should have already done, by stopping all sin and doing what is right according to Yahweh’s instructions found in the law, writings and prophets. It’s the only Scriptures they had, but they also had the Spirit to see the world differently and to avoid the evils in the world. Paul, John, and everyone else were teaching from the Spirit of Yahweh and the Scriptures. And what does Paul tell some of the brethren? Wake up from your drunken stupor, as is right, and do not go on sinning. For some have no knowledge of Elohim. I say this to your shame, 1 Corinthians 15:34 ESV. The message was clear. It was also clear that we are dealing with some of the same problems today. The Apostle James also agreed with John and Paul that those breaking Yahweh’s laws and ways of doing things needed help, and could receive forgiveness if they came back and stopped sinning. Brethren, if any among you may go astray from the truth, and any one may turn him back, let him know that he who did turn back a sinner from the straying of his way shall save a soul from death, and shall cover a multitude of sins, James 5:19–20 YLT. Why did they teach what they did? Because they knew that there is always hope for an individual who will stop sinning. It’s those who will not stop sinning that are done. There is a death ultimately waiting for those who continue in sin, but Yahweh is merciful toward those that do repent. For as the heavens are high above the earth, so great is His mercy toward those who fear Him; as far as the east is from the west, so far has He removed our transgressions from us. As a father pities his children, so Yahweh pities those who fear Him. For He knows our frame; He remembers that we are dust, Psalm 103:11–14 NKJV. So don’t take things lightly, fight the good fight, don’t become complacent or idle. Yahshua, the Messiah, came that we might have Life in the New Covenant. He was the Sacrifice for our sins. We should remember that is and was through Him (as the Mediator, between man and Yahweh) that the instructions were written down in the Scriptures for us to live by. It’s literally His Word. Knowing this, let’s look at a warning from the Master. Everyone who comes to Me and hears My words and acts on them, I will show you whom he is like: he is like a man building a house, who dug deep and laid a foundation on the rock; and when a flood occurred, the torrent burst against that house and could not shake it, because it had been well built. But the one who has heard and has not acted accordingly, is like a man who built a house on the ground without any foundation; and the torrent burst against it and immediately it collapsed, and the ruin of that house was great. He’s saying that it’s not just faith alone, but actions, which are needed. We need to build upon Yahweh’s Word and also have faith in Yahshua. We should not only be in the Word, but have the weightier matters of the law in abundance as well. It’s through the Spirit of Yahweh and in Messiah that all this is attainable and achievable. It is within our reach. It is True Love which flows from Yahweh's Spirit. Paul’s statement to Timothy is where we get the term "fight the good fight," and if we are fighting, we won’t be idle. So let’s close with what he wrote to Timothy years ago, which is just as applicable today as it was then for all of us in Messiah Yahshua. fight of the faith. Take hold of the eternal life to which you were called when you made your good confession in the presence of many witnesses. In the sight of Elohim, Who gives life to everything, and of Messiah Yahshua, Who, while testifying before Pontius Pilate, made the good confession, I charge you to keep this command without spot or blame until the appearing of our Master Yahshua Messiah, 1 Timothy 6:11–16 NIV. Have we considered our idleness lately? Are we doing enough? Are we doing what Yahweh instructs and, in fact, commands us to do? Is there more we can do? Do we sense the spiritual fight we are in? Do we need help? Are we enduring to the end? Fast and pray. Call upon Yahweh. He will provide the help we need. Let's not lose our first love. Make Yahweh, though Yahshua, a priority once again. In doing so we will overcome the idleness that Scripture warns us against having.